NJB Article and Source Repository: The Meaning of an Olympic Snub. By Bret Stephens. The Meaning of an Olympic Snub. By Bret Stephens. The Meaning of an Olympic Snub. By Bret Stephens. Wall Street Journal, August 15, 2016. Bret Stephens and the politics of Jewish ethnocentrism. By Yakov Hirsch. Mondoweiss, August 17, 2016. Refusing to shake hands is childish, but turning a blind eye to racial discrimination is criminal. By Nasim Ahmed. Middle East Monitor, August 18, 2016. A new milestone: BDS at the Olympics. By Nadia Elia. Mondoweiss, August 21, 2016. The Arab world has a problem of the mind, and its name is anti-Semitism. An Israeli heavyweight judoka named Or Sasson defeated an Egyptian opponent named Islam El Shehaby Friday in a first-round match at the Rio Olympics. 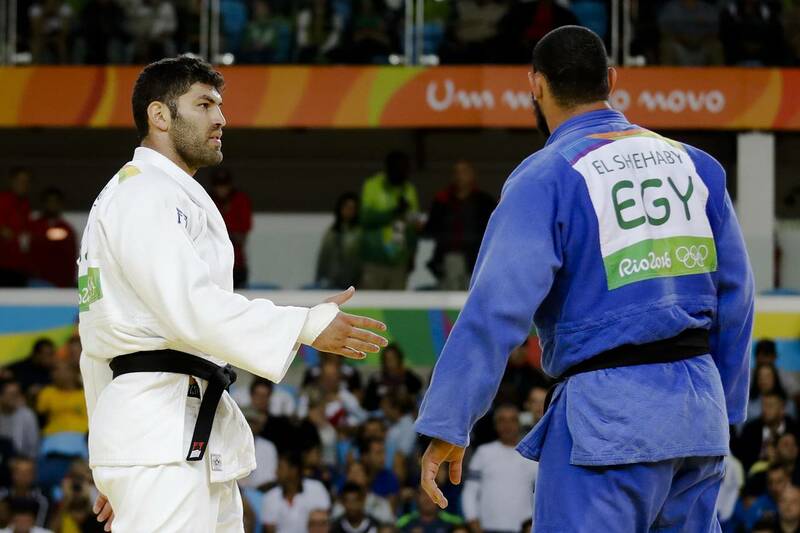 The Egyptian refused to shake his opponent’s extended hand, earning boos from the crowd. Mr. Sasson went on to win a bronze medal. In his essay, Mr. Johnson called anti-Semitism a “highly infectious” disease capable of becoming “endemic in certain localities and societies,” and “by no means confined to weak, feeble or commonplace intellects.” Anti-Semitism may be irrational, but its potency, he noted, lies in transforming a personal and instinctive irrationalism into a political and systematic one. For the Jew-hater, every crime has the same culprit and every problem has the same solution. Anti-Semitism makes the world seem easy. In doing so, it condemns the anti-Semite to a permanent darkness. Today there is no great university in the Arab world, no serious indigenous scientific base, a stunted literary culture. In 2015 the U.S. Patent Office reported 3,804 patents from Israel, as compared with 364 from Saudi Arabia, 56 from the United Arab Emirates, and 30 from Egypt. The mistreatment and expulsion of Jews has served as a template for the persecution and displacement of other religious minorities: Christians, Yazidis, the Baha’ i.
Hatred of Israel and Jews has also deprived the Arab world of both the resources and the example of its neighbor. Israel quietly supplies water to Jordan, helping to ease the burden of Syrian refugees, and quietly provides surveillance and reconnaissance capabilities to Egypt to fight ISIS in the Sinai. But this is largely unknown among Arabs, for whom the only permissible image of Israel is an Israeli soldier in riot gear, abusing a Palestinian. Successful nations make a point of trying to learn from their neighbors. The Arab world has been taught over generations only to hate theirs. This may be starting to change. In the past five years the Arab world has been forced to face up to its own failings in ways it cannot easily blame on Israel. The change can be seen in the budding rapprochement between Jerusalem and Cairo, Riyadh and Abu Dhabi, which might yet yield tactical and strategic advantages on both sides, particularly against common enemies such as ISIS and Iran. That’s not enough. So long as an Arab athlete can’t pay his Israeli opposite the courtesy of a handshake, the disease of the Arab mind and the misfortunes of its world will continue. For Israel, this is a pity. For the Arabs, it’s a calamity. The hater always suffers more than the object of his hatred.